We have a massive sweet tooth here at Hello May HQ. Rarely does an afternoon go by without someone swivelling around in their chair and offering (or asking for) chocolate! So it should come as no surprise that hunkering down to round up some serious wedding cake inspiration was a task we took to happily. Seriously guys, just look at this gorgeous three-tiered creation (above) from Melbourne baker Miss Lady Bird Cakes. Who wouldn’t want to stare at this (or more accurately droll over it) all day long? And don’t even get us started on this Black Forest Rosella cake (directly below) by another of our fave Melbourne makers Sticky Fingers Bakery – Dark chocolate, sour cherries and native rosella/hibiscus syrup? Don’t mind if we do! You’ll find loads of other gorgeous cakes below (including some that are decorated with doughnuts and others that 100% pure doughnut tower). 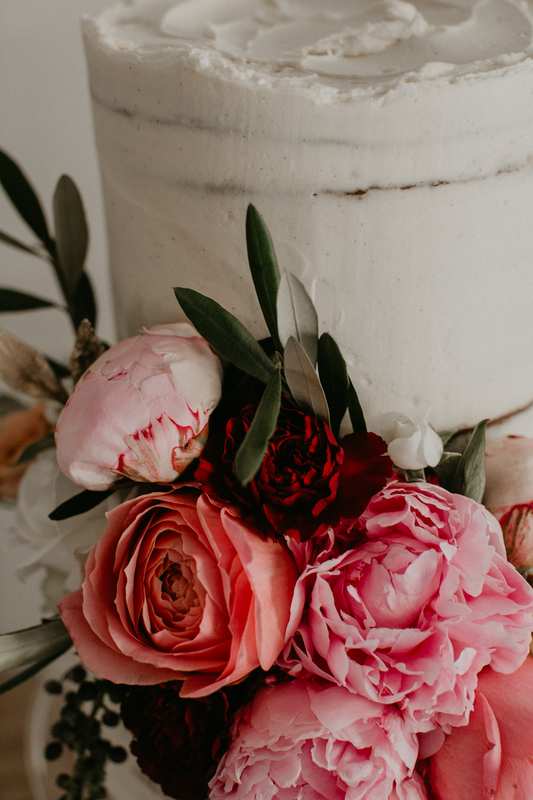 You’ll also find Danielle and Stuart cake from this epic Byron Bay wedding and Elise and Mario’s cake from their Mecca Cosmetica wedding along with Amy and Mikes square (yes square!) cake from their Porteno wedding we featured on the blog recently. Rounding out our faves is the two-tiered semi-naked fig cake from New Zealand fave The Caker (If you’re tying the knot in Auckland drop this woman a line pronto) and what can only be described is a piece of art from Forty Two Cakes in Canberra. These guys service the South Coast and Southern Highlands so if you’re getting married this way be sure to drop them a line also. You can check out more from Sticky Fingers Bakery right here and Miss Lady Bird Cakes here. You’ll find more from The Caker and Forty Two Cakes in our fourth annual Real Wedding Special. We have limited copies of this issue (complete with a gorgeous cover illustration by Blacklist Weddings and 35 never before seen real weddings jam-packed with big day inspo) available here on our online store. CREDITS (from top) It’s Beautiful Here (Miss Lady Bird Cakes), Pierre Curry Photography (Sticky Fingers Bakery) Amanda Alessi Photography, Barefoot and Bearded, Charlotte Exton Photography, Elsa Campbell Photography, David Le Design Photography, Fox and Kin Photography, Georgia Vverrells Photography, Jesska Judd, Joseph Willis Photography, Ebony Blush Photography, Samantha Heather Photography, Andrew Hardy (Forty Two Cakes), Samuel Jacob Photography, Willow and Co, Amy Kate Photography (The Caker NZ), Shae Estella Photo (Forty Two Cakes).